I don’t really know where I fall in any sort of spectrum regarding my opinion on this, but I do know what I think; how I interpret things. I have a fairly firm belief in a balance in all things creating a better whole. As such, I expect any field I work with to have some percentage of both ends of a spectrum, and the shades of gray between them. I work in a User Experience group, but I fully believe in the idea that User Experience, by itself, isn’t *really* a discipline. I’m of the mind that it’s a group of disciplines. I don’t think this is my thought. I don’t think it’s an original idea. 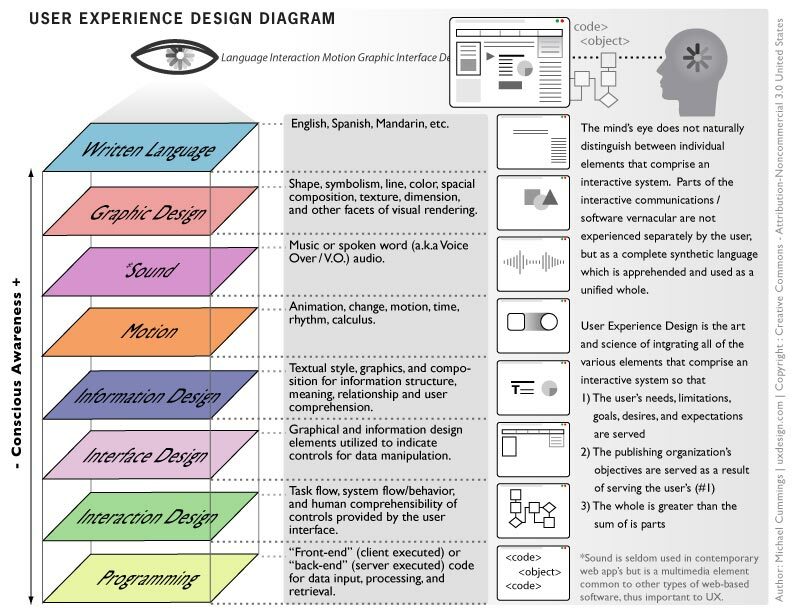 I can cite multiple charts that attempt to explain what disciplines make up this elusive thing called User Experience. The wonderful thing about these charts is that they tend to all be true. The answer tends to be appropriate to the organization. What a UX Strategist, or Architect, or Designer, does, exactly, and who they belong to as a group, is more a function of how a particular company envisions the role. Mostly, I believe User Experience professionals should share the common goal of being an advocate for a user’s positive experience (Crazy. I know.). I also believe this is a deliberate business strategy. There cannot be someone in an organization responsible for User Experience, unless someone, somewhere within the business has made a conscious decision to make that an important part of what they do. If you have “User Experience” in your title, you have a responsibility to adhere to the user’s needs. That means passionately, but diplomatically, speaking on the user’s behalf and ensuring that the correct testing is completed to meet the needs articulated by the users. And to redefine strategy on how to achieve those needs if current business and/or technical restrictions prevent a full solution from first release. One day (and arguably some apps & sites are already evolving toward this) a UX professional’s role may be to exceed just a positive experience for the user and to create environments that the user wants to return to, when they have need of the environment, because they recall it as an exceptional experience. We’re on a path to make experiences positive between technical sites and physical spaces. I’m motivated by a need to what is right for the user. I believe in design as problem-solving. I believe people working together are more effective than people working with their heads down, in cubicles. I believe in empathy. I believe human needs and business needs can both be met. I believe that a focus on user needs and positive experiences are going to define the next era of business. Unfortunately, I don’t think there’s a one-size-fits-all approach to shepherd the business world into this brave new era. I think there’s a lot of brave, empathic, intelligent people who are willing to come up with creative solutions to meet business needs without dehumanizing users. I believe that’s what UX is.